This pup doesn`t care, call him four eyes if you dare, but he prefers solar `eyes`! This sculpture is a `smart` addition to your outdoor decor with big bright black framed eyes, he will mesmerize you as he shows you the way home! Expertly cast in resin and hand-painted in fine detail, this amazing 9 inch (23 cm) high, 5 inch (13 cm) long, 6.5 inch (17 cm) wide sculpture will dutifully sit in an entryway, stay put on the patio or watch over your garden. The solar panel on the back contains an on/off switch, no batteries needed! 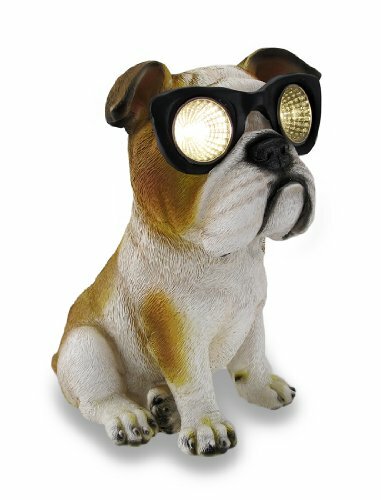 He`s a fun addition anywhere, and makes a wonderful gift for a Bulldog loving friend!